Fill a large pot with water and salt generously. Bring to a boil and cook the lobsters for 4 minutes. Immediately transfer the lobsters to a boil of ice water to stop the cooking. Reserve. In a small saucepan, warm up the olive oil (this can also be done in the microwave oven). Transfer the warm oil to a food processor and add the lovage or celery leaves and the curry powder. Mix until you get a smooth, homogenous texture. Strain using a chinois and reserve. Place the hazelnuts on a baking sheet and oven-roast them. Let cool completely. Make a fine concassé with the hazelnuts using a mortar and pestle. Reserve. Using a chef's knife, cut the lobsters in half and break the claws. 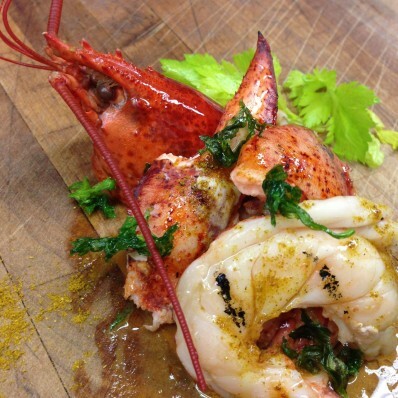 Slather each lobster half with the curry and lovage (or celery) oil. Place the lobsters on the BBG grill meat side up to finish cooking them. If required, brush the meat with oil to avoid it drying out. It is not necessary to turn the lobsters over. Sprinkle the lobsters with the hazelnuts concassé and serve. I was anxious to try something with this recipe: adding a hazelnut or coconut concassé at the very end of the cooking process or even just before serving. I did, and it works! You can also serve your favorite fruit salsa, preferably dominated by peaches or apricots. Why, you wonder? Because they all share the same aromatic profile as the Le Blanc, Pays d’Oc IGP, Chartier Créateur d’harmonies, France (SAQ Code 12068117). Believe me when I say that the result is greater than the sum of its parts, and that’s what the Taste Buds and Molecules science is all about. All the ingredients used here — curry, hazelnuts, lovage or celery leaves, apricots, peaches — are in the lactones aromatic family, which are also present un barrel-aged wines. Prefer whites that were aged in oak, especially the Languedoc chardonnay, grenache blanc, rolle and/or roussanne, such as the Le Blanc, Pays d’Oc IGP, Chartier Créateur d’harmonies, France (SAQ Code 12068117).